April 9 & 10, 1954. …. On more production on the ninth and tenth brings the total for that week to FIVE. This is the Young Wick Players of Southwick in The Ghost Train, which they will present at the Barn Theatre. This will serve as an introduction to two new members, Peter Kirby and Anita Cavaliero. Bearded Desmond Tyler, who made such a hit as the tramp in The Girl Who Couldn’t Quite, will play the part of the stationmaster. Production will be by Betty Gedge. THERE were startled faces among the passengers alighting at Southwick station on Tuesday evening. Could this ginger-bearded porter with the flowing locks and twinkling eyes really be a British Railways employee? Was that huge parrot cage really intended as freight? The sight of a pistol being brandished, too! Alarm quickly subsided, however. The Young Wick Players were just getting some “atmosphere” for their next play, The Ghost Train – thanks to the kindness of the local stationmaster. 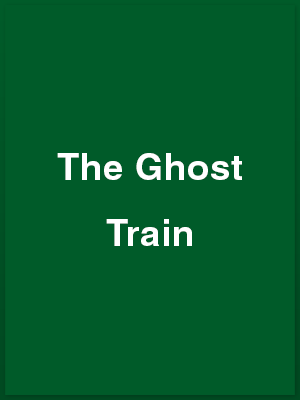 The Ghost Train will be performed in the Barn Theatre on Friday and Saturday next. ALTHOUGH there was a full house at the Barn Theatre on Friday, the Young Wick Players failed to respond to the mood of the audience in the presentation of Arnold Ridley’s comedy, The Ghost Train. Suspense was admirably achieved in the first two acts but the finale, although widely known, lacked force, I felt, and ended only because there were no more lines to say. Only Ian Elliott, as Teddie Deakin, of the secret service, tried to make the scene a comedy, although he assumed rôle of a ‘toff’ was strained. Much of the contact between the cast and the audience was lost by the long intervals, which gave the impression of three one-act plays. There was no scene shifting to be carried out and no change of costumes but in the second interval the public, after cups of tea, biscuits and a cigarette, filled the hall with their talk. The sound effects were brilliant. Desmond Tyler, as Saul Hodgkin, the old stationmaster with beard and flowing locks, made the best of the comedy. But he, like others of the male cast, forgot lines more than once. Ralph Dawes was realistic as Richard Winthrop. Diana Hubbard, as his bickering wife, gave good support. Edwin Tupper as Charles Murdock was excellent with his timing and Anita Cavaliero as his bride gave a performance that was always consistent. Betty Carpenter was outstanding as Miss Bourne, the nervous spinster. Eileen Turley gave a good impression of a girl seemingly deranged by ghostly experiences, but was unable to achieve the sudden change to the rôle of tough gun moll. Peter Kirby, as her brother the arch villain in the gun running plot gave a creditable performance but Godfrey Evans as an accomplice left much to the imagination. Peter Carpenter was Jackson, a police officer aiding the secret service man. The producer was Betty Gedge and the stage manager, John Wilson. Lighting effects were by Frank Hurrell and the other effects were by John Chatfield, Barbara Mott looked after properties and Maureen Futcher the wardrobe. Another performance was given on Saturday. TO be marooned for the night on a gloomy country railway station is a depressing situation in itself but when a weird old stationmaster adds to the general depression with stories of a ghost train and sundry dead bodies it becomes decidedly spine-chilling. In Arnold Ridley’s The Ghost Train which the Young Wick Players presented at the Barn Theatre last week the situation becomes positively blood-curdling before it reaches a sane and reasonable conclusion. The Players were a little unsure of themselves in the early scenes but warmed up as the theme developed and achieved a breath-taking curtain to the second act. Ian Elliott did well as the affected young man of the party who turns detective in disguise, and Betty Carpenter contributed light relief as the respectable spinster who becomes intoxicated. There was good performances from Eileen Turley as gunwoman Julia Pace and Desmond Tyler was an extraordinary stationmaster, though a little monotonous in his longer speeches. Ralph Dawes, Diana Hubbard, Edwin Tupper, Anita Cavaliero, Peter Kirby, Godfrey Evans and Peter Carpenter completed the cast, and production was by Betty Gedge. IT was all aboard for The Ghost Train at the Barn Theatre, Southwick on Friday and Saturday, thanks to the enterprising Young Wick Players. Arnold Ridley’s mixture of comedy and thrills alternatively provided laughter and some minor spine-chilling moments. The production had much to commend it, but the pace, strangely enough, was a little too hectic and some golden opportunities for suspense-laden drama were rushed over, marring in a welter of words the eerie atmosphere which the play should engender with increasing intensity. All the same, the cast can chalk up this old favourite as a feather in their caps – if not a very big one. Ian Elliott played the apparently irresponsible young fool, Teddy Deakin, whose thoughtless action resulted in a party of rail travellers missing their connection and having to spend a hair-raising night in dreary Fal Vale station, in the wilds of Cornwall. He brought strong humour to the rôle, and was equally in control of the situation when he was revealed as a secret service agent hot on the trail of gun runners. There was light relief, too, in Betty Carpenter’s appearance as fussy Miss Bourne, complete with parrot. Other travellers were capably played by Edwin Tupper and Anita Cavaliero [the honeymooning Murdocks] and Ralph Dawes and Diana Hubbard [the estranged Winthrops]. The mysterious old station-master, Saul Hodgkin, came to life through Desmond Tyler, though he could have been more sinister. The gang, whose night operations were so upset by the arrival of the party comprised Eileen Turley, Peter Kirby and Godfrey Evans, and Peter Carpenter appeared as a secret service man. Miss Turley had a particularly difficult rôle as the female crook masquerading as a mentally deranged girl to heighten the legend of the ghost train, and can be forgiven her failure to bring quite the requisite touch of the macabre to the part. Less easy to forgive is the fact that even on the second night the promptress had to put her spoke in, certainly more than once – a pity in any play and doubly so in this, which should have been pregnant with uninterrupted foreboding. Backstage effects were excellent, thanks to John Chatfield and there was good work by John Wilson [stage manager], Frank Hurrell [lighting] Barbara Mott [properties] and Maureen Futcher [wardrobe]. Production was by Betty Gedge who had The Ghost Train on the right lines for most of its run.